With vehicle details so we can help ensure this part fits your vehicle - we aim to respond within 2 working hours. 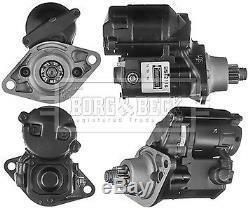 Starter Motor BST2116 Borg & Beck. SUBARU FORESTER (SF_) 2.0 AWD (SF5). SUBARU FORESTER (SF_) 2.0 S Turbo AWD (SF5). SUBARU IMPREZA Coupe (GFC) 2.0 Turbo AWD. SUBARU IMPREZA Estate (GF) 1.6. Model year from: 01/1994; Model year to: 09/1996. SUBARU IMPREZA Estate (GF) 1.6 i AWD. SUBARU IMPREZA Estate (GF) 1.8 i AWD (GF6). Model year from: 05/1993; Model year to: 09/1996; Vehicle Equipment: for vehicles with manual transmission. SUBARU IMPREZA Estate (GF) 2.0 i. Model year from: 03/1999; Vehicle Equipment: for vehicles with manual transmission. SUBARU IMPREZA Estate (GF) 2.0 i 16V AWD. Model year to: 03/1999; Vehicle Equipment: for vehicles with manual transmission. SUBARU IMPREZA Estate (GF) 2.0 i AWD (GF8). SUBARU IMPREZA Estate (GF) 2.0 i Turbo AWD (GF8). SUBARU IMPREZA Estate (GF) 2.0 Turbo GT AWD (GF8). SUBARU IMPREZA Estate (GG) 1.6 AWD. Model year to: 02/2003; Transmission Type: Manual Transmission. SUBARU IMPREZA Saloon (GC) 1.6 i (GC3). SUBARU IMPREZA Saloon (GC) 1.6 i AWD. SUBARU IMPREZA Saloon (GC) 1.8 i AWD (GC6). SUBARU IMPREZA Saloon (GC) 2.0 i (GC7). Vehicle Equipment: for vehicles with manual transmission. SUBARU IMPREZA Saloon (GC) 2.0 i AWD (GC7). SUBARU IMPREZA Saloon (GC) 2.0 i AWD (GC8). SUBARU IMPREZA Saloon (GC) 2.0 Turbo GT AWD (GC8). SUBARU LEGACY Mk II (BD) 2.0 i 4WD. Model year to: 10/1998; Vehicle Equipment: for vehicles with manual transmission. SUBARU LEGACY Mk II (BD) 2.2 (BD6). Model year to: 01/1998; Vehicle Equipment: for vehicles with manual transmission. SUBARU LEGACY Mk II (BD) 2.2 i 4WD (BD7). SUBARU LEGACY Mk II Estate (BG) 2.0 i. SUBARU LEGACY Mk II Estate (BG) 2.0 i 4WD. SUBARU LEGACY Mk II Estate (BG) 2.2 i 4WD (BG7). Model year to: 02/1990; Transmission Type: Manual Transmission. SUBARU LEGACY (BC) 1800 4WD. SUBARU LEGACY (BC) 2200 4WD (BC6, BC7). SUBARU LEGACY Estate (BC, BJF) 1800. SUBARU LEGACY Estate (BC, BJF) 1800 4WD. SUBARU LEGACY Estate (BC, BJF) 2200 Super 4WD. The item "Starter Motor BST2116 Borg & Beck 23300AA40A Genuine Top Quality Replacement New" is in sale since Wednesday, January 24, 2018. This item is in the category "Vehicle Parts & Accessories\Car Parts\Electrical Components\Starter Motors". The seller is "carpartsinmotion" and is located in Leeds, United Kingdom. This item can be shipped to United Kingdom, Austria, Belgium, Bulgaria, Croatia, Cyprus, Czech republic, Denmark, Estonia, Finland, France, Germany, Greece, Hungary, Ireland, Italy, Latvia, Lithuania, Luxembourg, Malta, Netherlands, Poland, Portugal, Romania, Slovakia, Slovenia, Spain, Sweden, Australia, United States, Canada, Brazil, Japan, New Zealand, Israel, Hong Kong, Norway, Indonesia, Malaysia, Mexico, Singapore, South Korea, Switzerland, Taiwan, Thailand, Saudi arabia, South africa, United arab emirates, Ukraine, Chile.